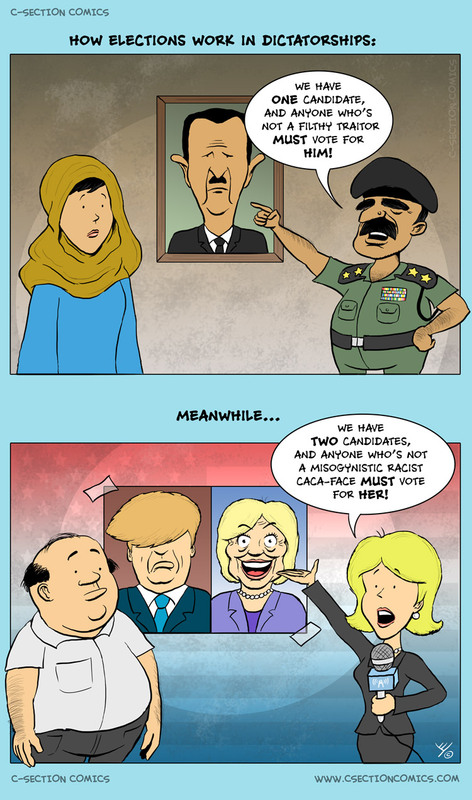 In dictatorships and totalitarian countries, such as Assad’s Syria or Mubarak’s Egypt, the regimes are fond of holding “Elections” with either only one candidate, or at most two candidates, one of which is sort of a “straw man” candidate (such is the case in Bashar al-Assad’s Syria, though in the cartoon I chose to depict it as a single candidate election). The idea of elections in dictatorships is to give the people the feeling of a democracy, while basically making sure the tyrant stays in office, usually receiving around 90% of the people’s support. Sometimes, such as in Azerbaijan’s 2013 elections, the results are miraculously known even before the elections were held! b) they are being told who to vote for by government officials, the government-controlled media in those countries, the police, the army. c) they are aware that if they cast the “wrong” ballot, things will be bad for them. In totalitarian countries, Big Brother always seems to know who you voted for. Now for the latest US elections. No candidate will get 90% of the votes, we all know that. In fact, according to the latest polls, it’s more or less a tie between the two candidates. But it seems that the media (and by “the Media” I mean almost all major news sources, there are always exceptions) has taken a decisive stance in who should be the next president, and it’s making sure to tell us all who we should vote for. While we’ve seen these kind of things in the past, in the case of Donald Trump, the Media’s unanimity on making sure he won’t be elected is prominent more than ever. So much for being impartial. “We report, you decide” has been replaced with “We report and decide”. There is a frightening similarity between elections with “one candidate”, and elections with “one valid candidate”. In both cases, people are given only one valid option to choose from. Let’s be clear: the US is clearly not on the path of becoming a tyranny. Not even close. But when the media tells us all who we should vote for, it’s starting to sound more like the old Pravda, the communist regime’s newspaper back in good old days of the Soviet Union. A strong, independent and diverse media is important for a functioning Democracy, and when the entire press is all talking in one voice, saying the same exact things, it weakens their power. This is clearly not how free press in a democratic country should be. Looking for some diversity of opinion? My comics often present conflicting opinions to my own, so why not read them? 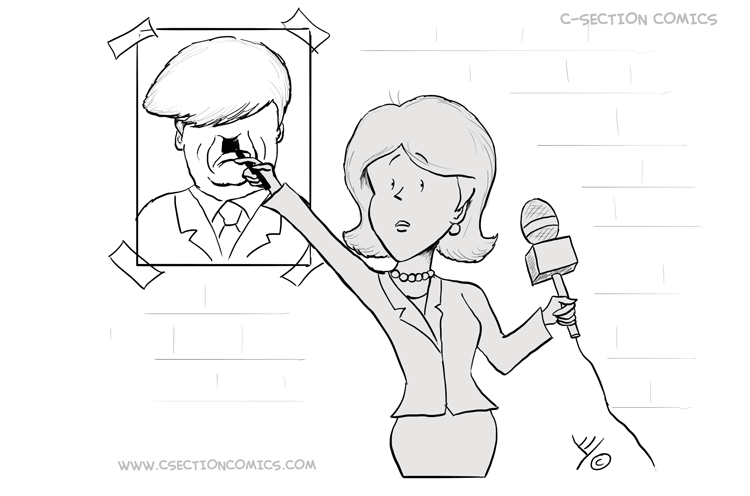 Here’s a previous cartoon about Elections 2016, and here are some more cartoons about politics.